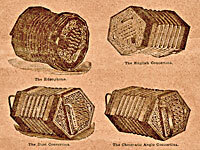 Resources in the Concertina Library for concertina systems. Concertina Library directory of all information on this website about Anglo-German and German Concertinas. A unique collection of nearly 40 pricelists for vintage concertinas, mostly found in old concertina cases. From internal evidence it is possible to date the Wheatstone pricelists with more or less accuracy, but the Lachenal pricelists and others from dealers still have some uncertainty in dates.